Fresh produce is good for you. Buying it grown in your own city is even better. The health benefits are obvious. With the region trying to emerge from the economic doom of the last three years, a greater emphasis, in the name of sustainability, has been placed on buying locally. The goal is to spend your money on good produced as geographically close to you as possible. Royal Oak Forward is providing solutions. The nonprofit, community-minded organization is the positive culprit behind the Royal Oak Community Farm, a tract of land in the city that grows organic vegetables and sells those goods to residents. The group brokered a deal with the city’s school district to reinvent a lot on 11 Mile into a farm. The property, the former Lincoln Elementary School location just east of Campbell on 11 Mile, now sees rows of earth-grown goodness. There, some 40 different vegetables – with 12 varieties weekly – are organically grown, harvested and sold locally. On Saturdays during produce season, Royal Oak residents can visit the Farmers Market on 11 Mile and buy any number of items – from basil to zucchini – or whatever is in that week’s harvest schedule. In the truest concept of community farming, these goods are grown, harvested, and transported approximately 1 mile away from the point of purchase. In 2009, the Royal Oak School District approved a deal that would rent the school property – the building was demolished in 2004 — to Royal Oak Forward on a zero-dollar lease. The arrangement is simple: The farm is welcome to operate, but the school district plans on selling the land. If it does, the farm has to relocate. The farm sustains itself financially by selling shares to neighbors. Baldwin says a full share is good for an entire growing season and costs $615. That fee provides enough fresh produce for a family of four. A half-share costs $335 and feeds a family of two for the season. Shares for 2010 sold out long ago. A waiting list exists for 2011. Still, community support of the farm’s stand at the market – located outside of the south entrance at 11 Mile and Troy – could make the difference between survival and drying up. 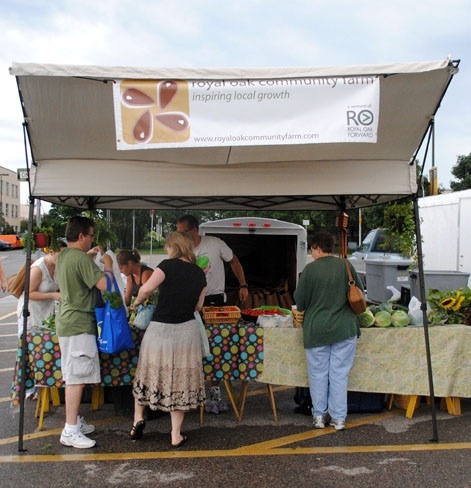 Those interested in Community Supported Agriculture (CSA) can buy produce in person on Saturdays at the Royal Oak Farmers Market or at Eastern Market in Detroit. Baldwin noted that some Royal Oak restaurants use the Royal Oak Farm-grown produce in their menu offerings. Those businesses include Inn Season, Café Muse, Lily’s Seafood and Zumba. The farm can remain operational, especially if shoppers spend their money at the booth. It’s not like Baldwin is trying to set people up in a Ponzi scheme. He wants to sell to you fresh radishes grown a mile or two from your front door. “We told everyone that if we make a profit it goes back to education,” Baldwin said. “If we profit, it goes back to the school district.” Presently, he added, the venture is operating at a break-even point. Sliding into the red could threaten the farm’s existence. As a result of patronage, the farm is able pay one, full-time employee. Trevor Johnson is the property’s organic farmer. Patronizing community farms, Johnson said, is about more than supporting a grass-roots effort. We spoke to him on the phone and he wasted little time, or conviction, getting to his point. The commercial food industry is structured to make money first, he said. And that includes large manufacturing plants, tons of waste, and a lot of fuel spent on semi-trucks. It’s good food that is not bad for you, is grown locally, and is designed to keep your dollar local. So, this type of consumerism is a no-brainer, right? Working full-time on community land to raise organic produce to sell to neighbors is Johnson’s job. He’s down at Eastern Market on Saturday mornings. He’s sweating it out in the sun. He wants the freshest, healthiest food for everyone in metro Detroit. And when he’s not doing all of that, he’s still furthering the goal of stretching the community buck, imploring neighbors to peel back a layer of that philosophy and take a peek. That brewer can pay a local wage or take a couple of bucks from his earnings and spend them at a local artist’s shop in downtown Royal Oak. That artist may donate a portion of her income to the animal shelter. That ripple’s breadth and depth is congruent to the size of commitment from the person holding the dollars. Johnson said the reward can be considerably more significant than just the personal warmth that one can hold, knowing they supported a local business. The farm’s weekly yield depends on what is at its peak. Baldwin said the forecast changes, based on soil conditions and weather. Still, they try to set out the schedule with roughly a week’s notice. 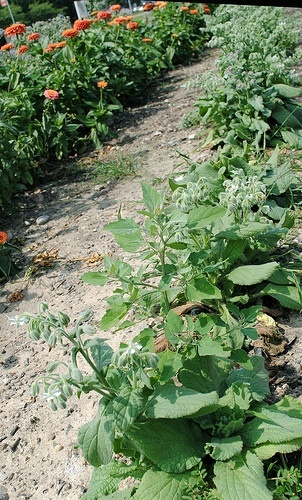 On one week, the offerings may include beans, new potatoes, Swiss chard, basil, and eggplant. The next week might serve up dill, carrots, cilantro, melon, and leeks. The farm’s Web site – www.royaloakcommunityfarm.com — lists the schedule, ways to get involved, and provides general information on CSA.